(MILES CITY, Mont.) – Ranchers and students of effective livestock handling have the opportunity to learn from low-stress stockmanship expert Whit Hibbard on Friday, Oct. 7 in Miles City. Hibbard will present a day-long seminar on stockmanship, which improves animal productivity, economic performance and human and animal safety. The clinic is hosted by the Montana Beef Quality Assurance program. The classroom style program will run from 9 a.m.-6 p.m. at the Miles City Livestock Commission. Pre-registration is $30, which includes lunch. Same-day registration costs $40 and starts at 8:30 a.m. Trained in the style of legendary livestock handler Bud Williams, Hibbard shares his experience as a working cattleman and lifelong scholar of animal handling in his clinics. 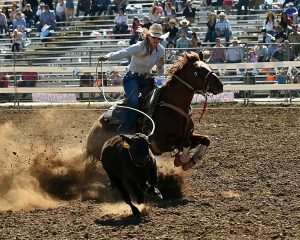 Hibbard is a fourth-generation Montana cattle and sheep rancher and former national park mounted ranger, and a student of low-stress livestock handling, natural horsemanship, ranch roping, and facilities design. He believes strongly in the importance and value of stockmanship and is committed to its serious study and promotion. Hibbard participated in a major paradigm shift on his family’s ranch, Sieben Live Stock Co. in Adel, Mont., from conventional to low-stress livestock handling. He was the director of a highly successful two-year project to round up trespass livestock from Mexico in Big Bend National Park which used a stockmanship approach and similarly walked in wild horses at Theodore Roosevelt National Park. Hibbard is the publisher and editor of Stockmanship Journal, authors a bi-monthly guest editorial for Drovers magazine on stockmanship, and teaches clinics on low-stress livestock handling. More information is available on the event Facebook page. Participants can register at Eventbrite at http://www.whit_hibbard_miles.city.eventbrite.com or by calling Bill Pelton at 406-671-5100.